FireRed Pokémon Dardusk - Alpha 0.1 Out Now! July 6th, 2016 (1:22 PM). 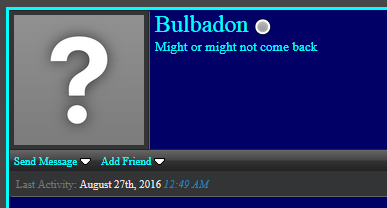 Edited July 24th, 2016 by Bulbadon. Another update: I've restarted working on this hack again since i gave up because it was so buggy I started again from scratch. I've been working on a new Pokémon hack everyone. It's called Dardusk and it's about a post-apocalyptic Pokémon world, where people and Pokémon come back from the dead. 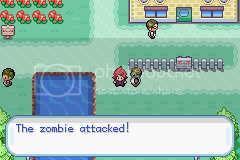 Yeah they're zombies. You play the game as Silver, Giovanni's son who has no clue what's going on around him and must fight to end the zombies and some even bigger and darker foes. And btw this game will have violence/gore/sexual themes but I'd say people aged 13+ should be able to play normally. If you're immature, childish and can't take a joke; don't play this. I will also not violate any of the 27 Amendments of the US since those are the laws I go by, so I'd say this game would be like reading a MA-17+ movie's dialogues. Not anything visually. -Physical/Special Split. I wasn't going to add this first but I've decided its more easier with it. -Only Silver is playable. Reason I did this because the story is about Silver and his adventures not anyone else. Some other character wouldn't fit in this story. -Play as Silver. Yeah you can name your player anything but he's still Silver. You're out on a journey to set everything right and find your father. -Some Fakemon. There will mostly be the original Pokémon up to Gen 3. I've decided I'm adding Gen 4-6 Pokémon, maybe some Gen 7. I made about 5 Fakemon before but I got angry and deleted them but I'll start on them again. -Indoor running. Most hacks have these, not big of a feature, just felt like putting it up here. -New maps. It will be based on Kanto but a more post-apocalyptic Kanto. -Zombies. 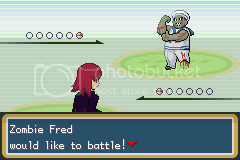 Zombie Pokémon and people. Yeah kind of like Pokémon Snakewood, that's where I got the inspiration from. -Violence/adult themes. This is not a little kid's world anymore. There will be curse words in this game. -No gyms. 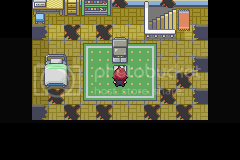 You find your badges randomly around Kanto. -New music. There will be some new music. -Scavenging. Everything won't be given to you on a silver platter, you have to look for them/earn them. 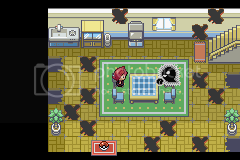 -No game breaking bugs in this but there are some places where I haven't changed anything yet like if all your Pokémon gets knocked out the ghost will talk to you like its your mom but it isn't supposed to be. -Silver's backsprite isn't completely done yet. The whole thing is 5 frames and I've only changed 2 frames so the other 3 frames are still Red in different colors. -If you use walkthrough walls cheat past the green guards it's still regular Viridian City from FireRed. I finished working on Alpha 0.1. I attached it to the thread so you can download and try it out. Try it out and let me know what you think. It's still very very very short only Pallet Town and Route 1 but it's a start I just feel like getting some opinions first. And also a MediaFire download link for anyone who doesn't use the forums. July 6th, 2016 (5:29 PM). 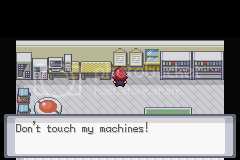 Reminds me of Snakewood... oh well, best of luck to you for this hack! July 7th, 2016 (6:21 AM). Oh man, this brings me years back to a hack called Snakewood, which had a similar premise. This looks pretty good so far! I love the zombie Nidoran. July 24th, 2016 (4:51 PM). Updated. Now you can download and play Alpha 0.1. Just added Pallet Town and Route 1. Well, I could've released it a bit later but I just need some opinions first. Give it a try and let me know how it is. July 25th, 2016 (12:40 AM). Silver's OW is pretty cool. Gotta play it now. July 25th, 2016 (1:17 AM). February 12th, 2019 (5:40 AM). I hope you are still working on this. I like the concept of it. February 13th, 2019 (8:43 PM). Definitely reminds me of Snakewood which became legendary for being so bad its good.Good luck with your project. February 14th, 2019 (11:12 AM). 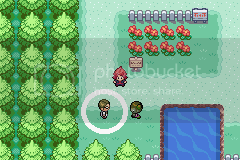 Honestly though I hope this game doesn't turn out as convoluted as Snakewood ended up being. Dear god that thing was a mess. March 1st, 2019 (2:12 AM). Edited March 1st, 2019 by Lunos. Guys? This is quite dead. Last post before ookami bumped this dead thread was from 2016 too. There's really, really, REALLY low chances this guy is coming back anytime soon and keep working on this. March 1st, 2019 (6:48 AM). March 1st, 2019 (4:37 PM). A shame really. Regardless, I probably should've looked more closely at the OP's post date.